Her name was Jester; but she had the look of a sea-dragon. It was not the first time Theophilus Quinn had thought this. The scarlet fanned sails with their wingish ribs made the analogy inevitable. But after the years he’d captained her, Quinn knew Jester better than most, and she was a dragon in every sense of the word. She sliced through the water with the skill of a sea-serpent, hunting her prey with fire in her belly and dagger-teeth in the hands of every crewman, gorging herself on gold and captives alike. Iron-armored hull. Red-silk wings. A love of treasure to rival any fairy-tale drake. Theophilus smiled, feeling the well-worn deck undulating under his hooves, and took a deep breath of salt air. His dragon. “Perhaps we’ll find some plunder for you today, eh girl?” he said, laying a hand on the ship’s side. He turned to find his first mate looking at him with cool amusement. Sphynx had a knack for hearing everything she wasn’t meant to hear, and nothing that she was. A smile fluttered across Sphynx’s face. “Develop?” Quinn returned, with appropriate indignation. Sphynx folded her wings against her tawny back in a kind of delicate shrug, staring out into space and yet somehow completely present. Half-human as she was, there was a lionish, indifferent grace even to her human half. The base of Quinn’s horns began to itch, and he scratched them irritably, stamping a hoof on the solid wood of the deck. He squinted at Sphynx. With a sigh of defeat, Quinn looked out to sea as well. The shore of Griza, a small and relatively ill-armed nation squashed between the larger countries of Sykar and Bresh, was just visible on the horizon. Quinn didn’t like venturing so close to lawful shores, but Jester had been out to deep sea for some months with little action and less plunder. The legend of the Jester and her crew had risen quickly, swept across the sea–and frightened enough traders off the open ocean that it seemed like to strangle itself. Sphynx looked at him askance. Quinn stiffened. He’d been so sure no one had seen that. Quinn turned to find her golden eyes looking directly at him for once. Half-mesmerized by them, he attempted, without success, to form a reply. Thankfully, they were interrupted by Mixen, one of the crewmen, zipping between them on miniature pixie wings. This was punctuated by a flourish of a sword as large as a toothpick. Behind Mixen’s back, Sphynx raised a single eyebrow. Her comments on his reputation still rankled, and Quinn gave the pixie a devilish grin. As it turned out, the flag was somewhat too large for Mixen to manage, and Horace the hawk-man had to raise it instead. But the flag was raised, and that was all the mattered as Jester’s sails were punched taut by a sudden turn into the current of the wind, and the sea-dragon of a ship flew over the water, speeding towards its slowpoke prey. “Sykar?” Sphynx, just back from rallying the crew into fighting order, suggested. 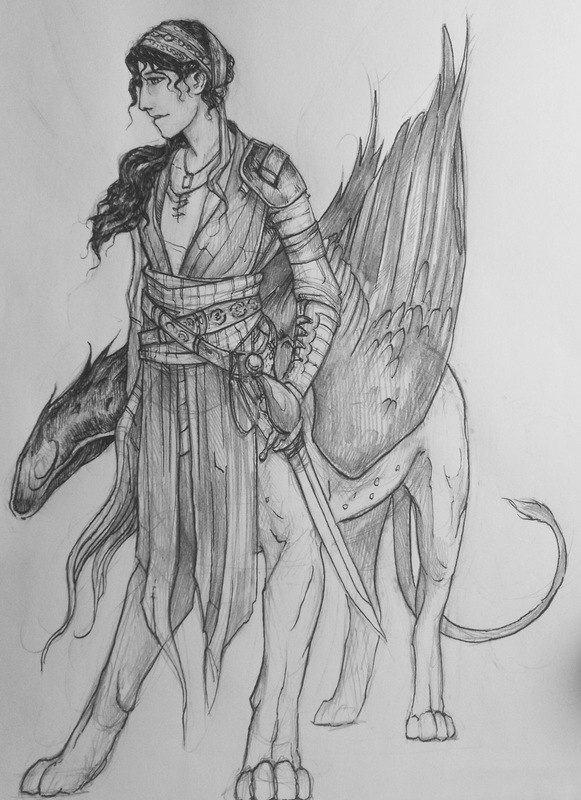 Centaurs. The proudest beings on the planet. And thankfully for Quinn, some of the richest. A smile snaked across Quinn’s face, then disappeared as he watched the ship. It was anchored, careless of their approach. Jester slowed, then stopped, bumping lightly against the Sea Centaur’s side. Half-planned war cries died in throats as the pirate crew, Quinn at their head, stepped gingerly onto the over-quiet ship. Not a single sailor was visible on the decks. No yellow plague banners fluttered from the masts to give its apparent abandonment a reason. “Did it…sail off on its own?” a faun asked, after a few moments. Quinn was tapping his fingers thoughtfully. Everyone stopped, blinked, and pretended to listen. With a blustering, half-timorous crew behind him, Captain Quinn set off in the direction of the cabin. One mighty kick from one of his hooves, and the door flew open. Someone screamed. “Oh, what is it now?” another voice grumbled. Inside the cabin, a huge centaur and a tall but stick-thin elf were standing on opposite sides of a table mounded with paper and ink-pots. One of the ink-pots had fallen on the floor, making the whole cabin smell like a printer’s shop. Quinn had been about to say something suitably threatening, but his mouth closed in surprise. He would have made some kind of lordly retort, but the centaur was talking to the wide-eyed elf now. Ever the enthusiast, Mixen flew into the cabin and brandished his toothpick wildly. 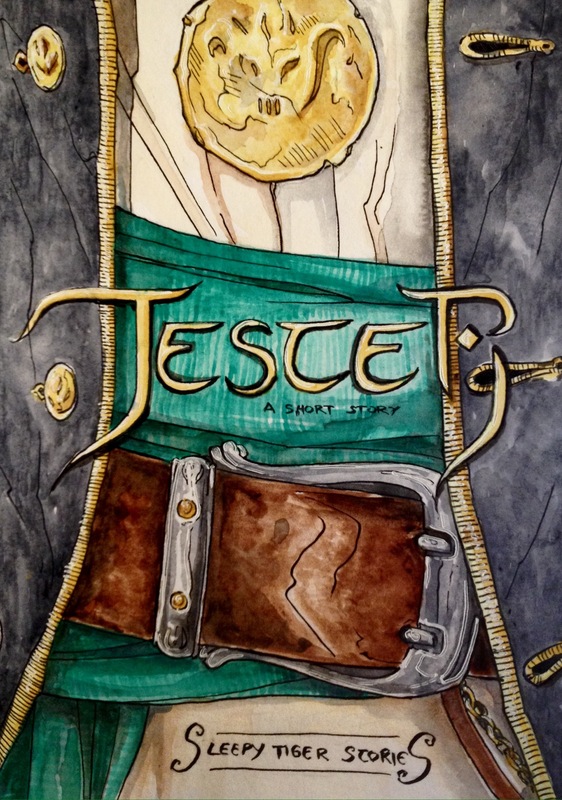 “That’s Jesters to you!” he roared. Or, he tried to roar. His warlike mein might well have been terrifying to another pixie, but to the gathered company, it was rather too squeaky to strike terror into anyone. The centaur even went so far as to raise his eyebrows. At this the elf only drew himself up higher. Quinn realized with a small jolt that he and his fearsome crew had been forgotten. While he did not, perhaps, enjoy the customary terror of a vessel’s inhabitants upon realizing that that they were faced with legendary pirates, he realized suddenly that he’d grown accustomed to it. Being ignored was discomfiting. In fact, he resented it. The elf, half-way through a particularly sizzling jibe, suddenly realized that a sword was being held to his throat. “And I–ah–hmm,” he coughed, looking at Quinn as though suddenly deciding to take in the meaning of his appearance–the scarlet lines inked over his face, the rings of stolen gold and silver haphazardly twisted to hang from his ears, his satyr’s horns etched with the symbols of the Thieves’ Guild. Then his eyes flickered to Mixen, whose tiny blade was tarnished with use, and Sphynx, with her blood-splattered coat and unsheathed claws. Lucius was slower to realize what was going on. And at that point he stopped, realizing that there were, in fact, weapons on the ship–and none of them were in his hands. This balance of power was new to him, and it provided Quinn with a silence that was his to break. He grinned. “Allow me to introduce myself, gentlemen. I am Theophilus Quinn, captain of the Jester. This is my crew.” Quinn spoke quietly, but evenly. He’d never quite got the hang of officious shouting, and the calm tone seemed to carry more authority anyway. Of course, the sword helped too. “As have I!” the elf declared, glaring in turn, and Theophilus grinned further. “If ‘justice’ is shorthand for having me publicly dismembered, then allow me to wish you both the most tragic of failures,” he said, with a bow. Mixen was struggling to pull something free from the stack of papers on the table, and with a nod to Sphynx and Horace to watch their two captives, Quinn strode over to join him. Quinn raised his brows, and Mixen was jittering with excitement. “Horace, what do you remember about the protocols for a legal parley?” the hawk-man had been a lawyer once. He blinked once at the odd question, but listed off the facts dutifully. Quinn caught a knowing glance from Sphynx, and grinned. She already knew. Whether it was fifteen miles or fifty, it hardly mattered; the Jester could fly free of this place in heartbeat, with better plunder than any pirate had ever claimed before. “There’s no gold for us on this ship,” he announced, and watched his crew deflate at the familiar news. Amidst the ruckus of cheers, Quinn heard the plaintive voice of Lord Berwen. Quinn smiled. Their bickering would quiet down soon enough, he wagered. No one could keep up a fierce argument for more than an hour or two. The voices of Lord Berwen and King Lucius were audible even on deck. Both locked in the brig, they had begun by trying to discern whose fault it was that they had both been kidnapped by pirates. This had taken them into a deep discussion of their respective countries’ methods of boat-building, and from there Quinn had lost the train of thought. At the moment, they seemed to be occupied with insulting one another’s great-aunts. Quinn turned in time to see Horace’s feathers ruffle. “I assure you, captain, I meant no–” he began to stutter, but Quinn waved a hand. “YOUR GREAT-AUNT BERTHA WAS A TASTELESS HAG!” a voice belowdecks bellowed. At the suggestion, Horace’s dejected countenance transformed into one of the purest joy. “Perhaps they’ve simply noticed that their kings have disappeared,” he offered, as Horace began a wild dance of victory across the deck. The approaching craft turned out to be less of a ship, and more of a boat. It drifted toward the Jester with all the caution of a kitten approaching a tiger. There were soldiers on deck, dressed in a drab mess of several different uniforms–Sykurian and Bresh alike, with a Grizan or two mixed in for good measure. Add in an official-looking minotaur and his two satyr attendants, and the boat was well crowded. Quinn had intended to speak first, but the minotaur evidently had no time for pleasantries. He adjusted his spectacles and peered up in the vague direction of Sphynx. “So! Is it done?” he shouted, in a voice that had taken on a bureaucratic reediness in spite of his massive form. There was a very long list of questions that, under the circumstances, Quinn might have expected. This was not one of them. He frowned down at the minotaur quizzically. “King Lucius!” a Sykurian soldier burst out, stepping out of ranks. “And Lord Berwen!” an elven archer joined in, stepping free as well. One of the satyrs was desperately trying to get the minotaur’s attention, but the minotaur only brushed him away. This last bit was hissed to the nervous attendant, who whispered into the minotaur’s ears as he directed wild gesticulations at Jester. Quinn blinked. Every soldier had been happily nodding at the minotaur’s chilling speech of treason. How were they supposed to hold two kings for ransom if no one wanted them back? It looked as though the royals would be staying aboard Jester a while longer. Half a plan was formed in Theophilus’s mind, and he snatched it up eagerly. Setting a rakish hoof against the ship’s rail and resting a lazy elbow on his knee, Quinn pretended to pick something out of his teeth. This halted the slowly retreating little ship in its wake. Everyone on board had the sense to look nervous now. “Actually, we were thinking about starting a unified oligarchy,” the minotaur posed, quaveringly. “I wished to return to the ways of our ancestors!” a Sykurian soldier shouted, stomping a hoof. “Hmm,” Quinn said, tapping his chin. “It seems you really do need a king–to organize you. And to, ah…what else do kings do?” he turned to Sphynx, who was wearing an edged smile. “Collect taxes, mostly. And build roads,” she supplied. 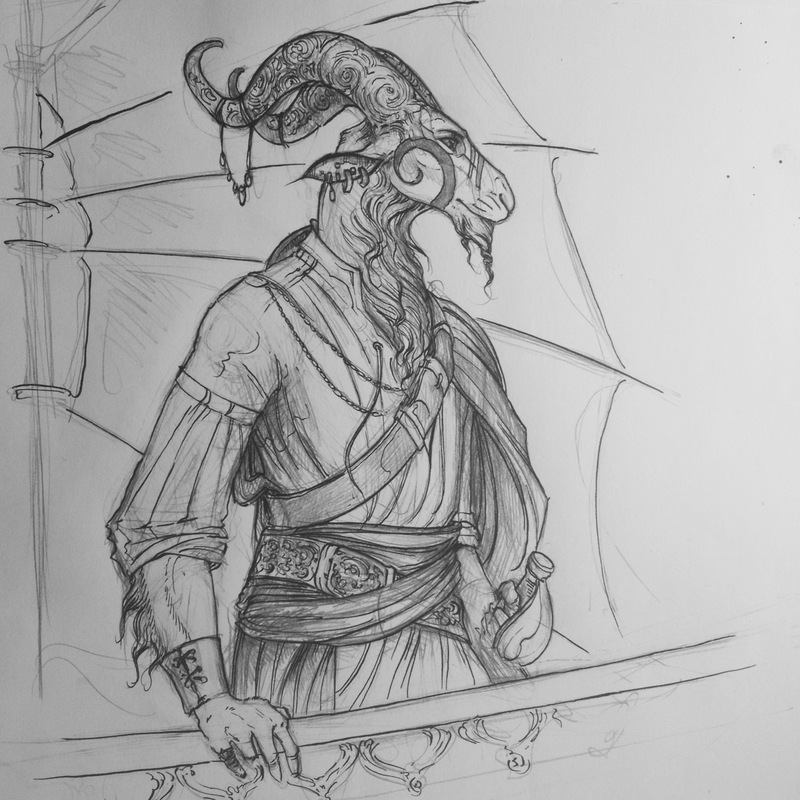 The minotaur blinked up at the ship, its looming cannons, and the sword-bearing pirate crew, and thought with a flash of rare insight that he had exchanged two simple fools for one cruel tyrant. If he had not yet considered the Jester as a sort of metaphorical sea serpent, he certainly did now; and he felt her coils wrapping, inescapable, around his throat. The slumped shoulders of the elven archers straightened. “They taste as though you made them out of rubbish-heap findings and acorn shells!” shouted a second voice, and the Sykurians raised their heads and swished their tails. Taking on an appearance of offense, Quinn huffed. “If you want them back, you’ll have to pay for them,” he said, folding his arms. “Your share,” Sphynx said, padding into Quinn’s cabin and plopping a bag of gold coins on his desk. He looked up at it, then at her. “Not bad for an evening’s work.” He put down his pen and spectacles. The ship’s log lay open on the table, the entry for the day still blank. “Not bad at all,” Sphynx yawned, sitting gracefully and wrapping her tail around her paws. She stretched her wings, folded them, and Quinn realized that he was paying unwonted attention to her magnificently glossy feathers. “Perhaps even…good,” she admitted, as he forcibly refocused on her face. “Good enough to earn that reputation for wit?” he was attempting a devilish grin, but she wasn’t in a gaming mood, for once. She stood up as gracefully as she’d sat down. “I think you would have made a good king.” She ruffled her feathers, announcing the conversation over. “But a better pirate?” Quinn asked as she began to stalk out the door, putting a small cough at the end of his words to hide the stutter that had begun them, and Sphynx halted, looking over her shoulder with a small smile. “Just don’t spend all that on pitiable old merchants,” she said. I’ve got a ton more. Why not take one of these out for a spin? Great story! Love your lively characters & sense of humour! And, as ever, your drawings bring it all to life! Enjoyed it a lot! Oh, this was fun! I especially enjoyed the repartee between Sphynx and Quinn. And the disagreement about what types of governments the various elves and centaurs wanted made me chuckle. AHHH yay I’m so glad you enjoyed it! The bits between Sphynx and Quinn were some of my favorites to write 😀 thank you so much! !